Why don’t we do those important things that we need to get done? You know you have to do it but somehow someway it still doesn’t get done. There are many reasons why we don’t do what really needs to get done. One of the key reasons that is preventing us from taking action is that we don’t really know our ‘why’. Why is this task so important to us? Mel Robbins, a prominent coach in the personal development world, has established that the reason that we don’t do things is because we don’t really know why we’re doing them to begin with. We might know of many ‘why’s handed down to us by parents, bosses, society etc. (money, status, the fancy car, etc.) but we don’t know our own truest ‘why’. Another key factor that influences procrastination beyond the why is what creates our why – our core desired feeling. What is the core desired feeling that you want to feel on a daily basis and how does this core desired feeling affect your why? I spoke to a client this morning whose core desired feeling is ‘transcendental’. In this instance, her why was about working on herself so that she can transcend and make a bigger difference to society through her writing. When getting to the root of her procrastination, writing every day, getting into flow and finishing a novel just wasn’t enough. She had to write in her personal journal in order to get into flow and understand herself so that she had something to transcend from. Her core desired feeling helped her create her why, which was vital for her to move forward with her goals. If you are ready to say goodbye to procrastination and make real progress to the next phase in your career, sign up for a complimentary strategy session with me HERE to create a solid action plan you can step into, to become your most productive and inspired self. Networking is usually an activity of going to an event, repeatedly giving your elevator pitch, maybe talking about the weather and giving out your business cards. As a society we have networking all wrong – there is more to networking than just this! Networking is really about creating deep and meaningful connections with people we wouldn’t have necessarily met in an everyday context. The point of networking is to get us to that next phase of our career, which might be a promotion or to further build our business. Networking is this magical vital tool that we have been using incorrectly. A lot of the time, I’ve noticed that people go to these events hoping and wishing to share what they do and see what they can get from as many people as possible. Unfortunately, this is not how deep and meaningful connections work. Establishing deep and meaningful connections will likely get you recommendations. Whereas with brief encounters, you’ll be lucky if anyone will remember you let alone recommend you. Nobody likes receiving a sales pitch out of context; it reeks of a desperation mind set. To get you into the next phase of your career, practice active listening. When you get to a networking event, you enable the next person to have a platform to share more about themselves. These days at networking events, everybody is eager to speak about what they offer. If you offer yourself as an active listener in networking spaces, you will stand out. You will gather key information that will tell you if there is some synergy between yourself and the other person. Do they have a connection somewhere you’ve applied? Are they desperately in need of your services? Remember, you can guide the conversation based on the questions you ask! Get into different spaces with different people. Actively listen. You can do this by asking questions and seeing how you can help someone else. At the end of the day, the people you genuinely connect with will be more than willing to help you make that next move in your career. If you are ready to get to the next phase in your career, sign up for a complimentary strategy session with me HERE to create a solid action plan you can step into, to become your most productive and inspired self. At the end of the day this job, that you might currently loathe, is part of your journey. By writing this letter you are partaking in a gesture of acknowledging this part of your journey in a different way other than complaining about how much you hate your job. When you first start a job, you may feel a sense of excitement, like you’re falling in love. It’s easy to see why you’re destined for this job in the bigger scheme of things. It might be a stepping stone for you to save more money to go back to school. It might be an entry level position for you to work your way up the ladder. Yet, as time goes by it’s easy to see less and less of the bigger picture that you had envisioned for yourself. What this exercise does is shift your perspective of where you’re at right now in your job. It can be written as a farewell letter. It can be written as a way to renew your commitment with your employer and/or the company you work for. It’s an effective way to gain resilience and get perspective on what your next move is. Work You Love has teamed up with Side Arts to offer creative consulting services which includes creative, strategic and experiential coaching. This article is part of an introductory series on creative growth. Follow along at sidearts.com/blog. Productivity is activity that positively influences the trajectory of your life whether at home, at work and with personal projects. With many conversations surrounding the age old “Why don’t I ever get anything done?” or “How the hell did I even get here [without achieving what I set out to achieve]?”, I decided it was time to give you two tools you can use to be more productive. The first tool was developed by Mel Robbins – the ‘5 Second Rule’. This rule helps you launch into whatever task you need to get done and prevent procrastination. The idea is to count backwards from 5 and move yourself physically towards achieving the task. For example, if you’re struggling to get out of bed, count down from 5 to 1 and physically get yourself out of bed. Or, if you remember something that needs to be done, count down from 5 to 1 and write that task down on your to-do list. The ‘5 Second Rule’ is about helping you make that first move towards being more productive. It creates that forward momentum for yourself. ‘The Tomato Timer’ is another great tool to help you be your most productive self. Traditionally, this tool is about setting a 20 minute timer where zero distractions are allowed. Yep, this means no phone, no Facebook, no cat videos; this means no distractions until you’ve completed the task at hand or the timer has hit 20 minutes. At the end of the 20 minutes you get a 5 minute break to do whatever you want or need to do and then you go back to 20 minutes of focused work. I would like to suggest for you to get a little more creative with your tomato timer. For example, I had a really long spreadsheet to update – something like 300 rows! So I made an internal agreement with myself. Do 20 lines at a time and take a short break to look at my phone, 20 lines, short break, 20 lines, SHORT break….you get the idea. If you feel like procrastination is getting the worst of you or you’re slacking at work or on your passion projects, sign up for a complimentary strategy session with me HERE to create a solid action plan you can step into. Become your most productive and inspired self. 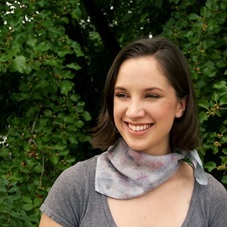 Carlee is an expert at helping people use art and creativity in order to find their passion again. As a firm believer in creativity, Carlee helps people find their purpose in life through a combination of coaching, creative expression and experiential activities. My good friend and colleague, Carlee Myers, from Work You Love told me about a great opportunity she is offering and I wanted to make sure you knew about it. On June 19th at 12:30PM ET, Carlee is offering a free online training on How To Find Work That Fills Your Wallet AND Your Soul. Carlee has improved and influenced HUNDREDS of lives in the United States through a combination of coaching, creative expression and experiential activities. A firm believer in creativity, Carlee helps people who are no longer happy in their job or life find their joy again. Recently, she had a client who was feeling pretty undervalued in his corporate job when they first met. Since they began working together, he has been able to make the changes he needed to be the best version of himself and now is about to accept a job that is in alignment with his truest creative talents and interests (this is just one success story of many!). The three simple steps you can take to find or build a career you love (yes, even in the arts). Creative processes that can get you on the path to your authentic self by helping you understand what it is that you really want out of life. Carlee loves sharing her secrets to personal and professional fulfillment. However, she does not do these free online trainings often so make sure you sign up here today. DO NOT miss your opportunity to learn from a true expert! If you have been feeling depressed or disillusioned with your career, Carlee is the perfect person to help you get your mojo back. Grab your spot and mark your calendar for June 19th at 12:30PM ET. You are only a click away from landing a career you love. Life as an artist can often feel like an uphill battle. There are dozens of adversities that can attempt to derail and distract you from your passion. We here in the Side Arts community know how vital it can be to find support in your artistic journey. Professional, mental and emotional support are integral to succeeding as an artist. Carlee Myers of Work You Love recently sat down to speak to a fellow artist and friend on how a Work You Love workshop provided her the space she needed to find a sense of artistic direction. Through creative personal development, she found a way out of a state of stagnancy and into a fulfilling career in art. Prior to the Feeling Salty workshop Naomi was in a space of having to let go of some of her pride. She was at a point of feeling stagnant in what she wanted to do. Naomi shared that she has a lot of ideas but finds it difficult to sometimes separate those ideas and focus in order to take the steps towards making her ideas a reality. One of her ideas was to move out of Philadelphia and out of Pennsylvania altogether. “I was at my wits end with myself…it was time to reach out…” – Naomi. Naomi needed a new approach so the timing of us meeting was indeed synchronistic. Initially, during the workshop she felt a sense of embarrassment in having to admit that she was ‘feeling salty’ – a term used to describe someone feeling angry, upset, lost or out of place. Through a process of positive affirmations and ‘playing with salt’ so to speak, Naomi felt like something was lifted from her and that she walked out of the Feeling Salty workshop feeling a sense of direction. “I had too many things on my mind…I was cluttered. I felt like I walked out with one thing to focus on, which was really important. I came out with an actual step.” – Naomi. Naomi kept following her step in order to avoid punishment for not following it! In workshops I sometimes get people to sign contracts with themselves and an accountability partner. In the contract, some actions deserve rewards if you fulfill them and other actions (or lack thereof) yield a punishment (the kind that suggests you’re getting on the island and burning the boat, the life vest, the bridge and any other vehicle that will let you sink back into your old ways). In addition to her self-imposed, bridge-burning punishment, Naomi would not have to use her entire savings on these shirts but also have to punt and ‘sell’ Make America Great Again. …her worst political nightmare. In accordance with her contract, Naomi regularly sent her completed resumes to job opportunities, CC’ing her accountability partner on each and every email. Now Naomi has healthcare, does yoga, is meeting new people and is really enjoying her new work…in her desired field, the arts! 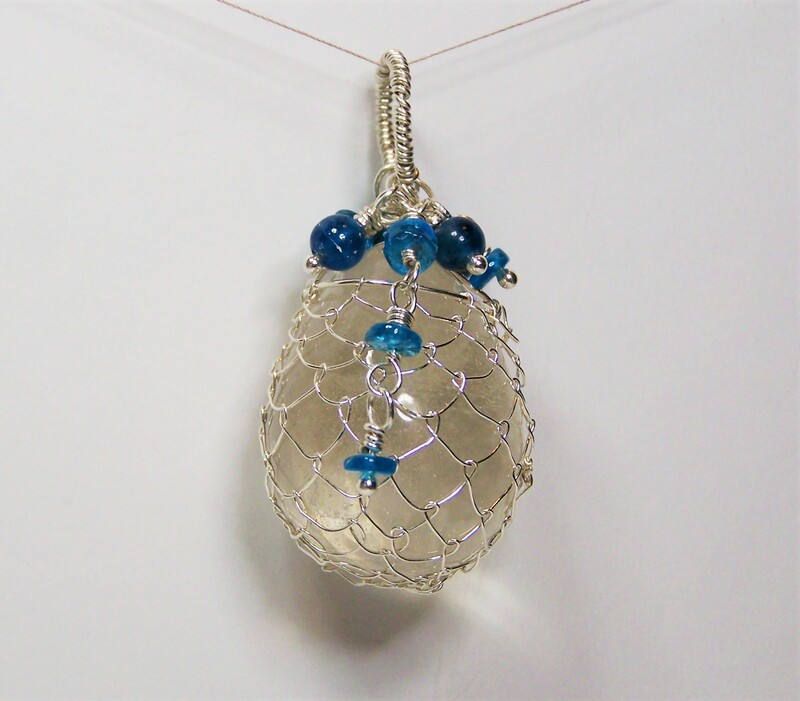 Hand-carved clear quartz crystal egg is gracefully cradled in a sterling silver net. Deep blue apatite gems dangle and drip from the bail. Measures (from bail) 1 1/2 inches long and 3/4 at widest area.